The new Camry is longer and wider than its predecessor. It also has a longer wheelbase. Unlike its predecessor, which was also available with just the petrol engine as well, the new one will be available with a hybrid powertrain only. The new Camry is based on the TNGA platform that also underpins the Lexus ES 300h. Toyota has launched the new Camry Hybrid in India at Rs 36.95 lakh (ex-showroom pan-India). The tenth-gen Camry was revealed in 2017 and goes up against the Honda Accord Hybrid in India. Unlike its predecessor, which was initially available with just a petrol engine, the new Camry will come with a hybrid powertrain only. Here is how the new sedan differs from its predecessor on paper. The new Camry is based on the new TNGA platform that also underpins the Lexus ES 300h. It is longer and wider than its predecessor. It also has a longer wheelbase. We reckon it might have more space on the inside as well, as a result. 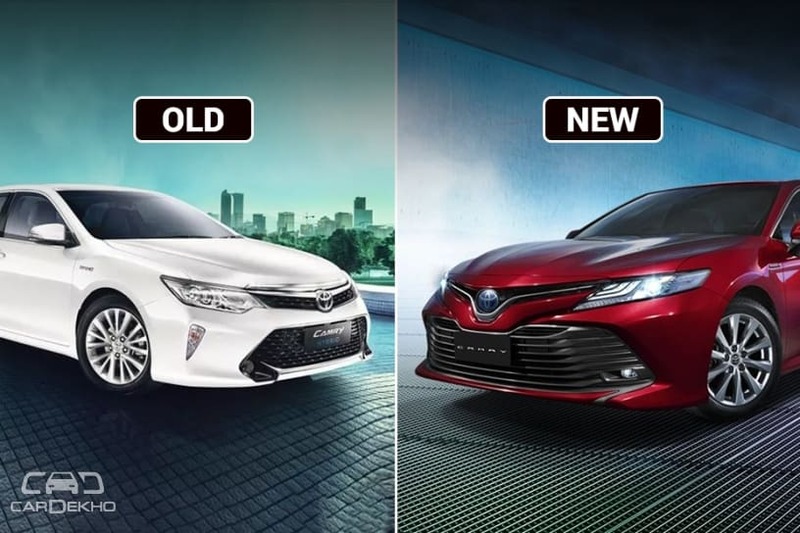 The new Camry looks more aggressive and modern than its predecessor. While the older Camry features an understated and boring styling, the new Camry looks more sporty. The front profile is dominated by the huge bumper which houses a big air dam with horizontal slats. There’s less chrome on offer now, and that adds to the reason why the new model looks sportier. The new headlamps are sleeker than before and flank the new V-shaped grille, which doesn’t look as wide as the older one but is chunkier in the middle. The bonnet is also heavily sculpted and that adds more muscle to the front profile. Like the outgoing version, the Toyota logo at the front is surrounded by a blue hue, reconfirming that it’s the hybrid model. Coming to the side, the profile looks quite similar to that of its platform sibling, the ES 300h. So the roofline is more coupe-like now and the C-pillar almost merges into the boot. In comparison, the older model had a more conventional three-box design, which, in our opinion, looks quite dated now. Around the back, where the older Camry featured chunky tail lamps, the new model gets sleeker, horizontally stretched units that emphasise the width of the car. The new Camry also features an integrated rear spoiler, adding to the sporty quotient of the sedan. Like the exterior, the interior too has received a complete makeover. The new interior looks more clean and simple. However, it continues to feature the black-beige treatment like its predecessor. The cluttered central console has been replaced by an 8-inch touchscreen infotainment system which sits flush in the dashboard. But the highlight of the 2018 Camry’s dashboard is a new character line that flows down from the instrument cluster and bisects the waterfall-like centre console. Like its predecessor, the new Camry also gets power reclinable rear seats and centre armrest with controls for infotainment, AC and other functions. However, while the older Camry had physical buttons on the armrest, the new model comes with touch-sensitive controls. The new Toyota Camry gets a sunroof, which is a first for a Toyota in India, a 10-inch heads-up display and a wireless mobile charger over and above the model it replaces. Let’s take a closer look at the rest of the features, shall we? Safety: Like its predecessor, the new sedan is equipped with nine airbags, ABS with EBD, brake assist, vehicle stability control, traction control system, hill start assist, tyre pressure monitoring system and park assist. Infotainment: While the older Camry was available with 2-DIN music system with Bluetooth, USB and AUX connectivity options, the new sedan is equipped with an 8-inch touchscreen infotainment system with Bluetooth, in-built navigation and USB support. It also gets a 9-speaker JBL audio system. Lights: The new Camry gets automatic LED headlamps, LED DRLs and LED fog lamps like its its predecessor. However, it features projector headlamps instead of multi-reflector units. Comfort: Like its predecessor, the new Camry is equipped with a three-zone climate control, a rear armrest with touch sensitive controls for AC, infotainment and other functions, rain sensing wipers, power reclinable rear seats, rear power sunshade, power tilt and telescopic steering wheel with memory function, ventilated and power adjustable front seats. Where the new Camry gets 10-way electrically adjustable seats, the older version had 8-way adjustable seats. Wheels: Instead of 215/55 R17 tyres on the old model, the new Camry gets 235/45 R18 tyres. Unlike its predecessor, the new Camry will be available with a hybrid powertrain only. It will be powered by a 2.5-litre petrol engine coupled to an 88kW electric motor that produces a total output of 218PS, which is 13PS more than its predecessor. The older was Camry also powered by the 2.5-litre petrol engine, but it was supplemented by a 105kW motor. Like the older model, the new Camry is also equipped with an e-CVT gearbox. The new Camry is priced at Rs 36.95 lakh (ex-showroom pan-India), which is Rs 27,000 less than its predecessor (Rs 37.22 lakh, ex-showroom Delhi).